Prunus genus belongs to the Rosaceae family and includes several hundred species of flowering trees and shrubs that mostly are deciduous. Most members are diploid (2n=2x=16) although a few polyploids exist. Several sequenced genomes in the genus are relatively small, about 2-3 times the Arabidopsis genome size. The leaves typically are simple and have shallow toothed margins. The flowers usually have five pink or white petals that appear before leaves, but double petals and/or other colors are common in ornamental selections. The fruits are a drupe that has a stone or pit (endocarp) enclosing a seed. Hence the common name for this genus is “stone fruit”. Most Prunus species are native to northern temperate regions and accordingly adapted to diverse soil and climatic conditions. The range of adaptability of commercial crops has been extended through breeding. Almost all commercial trees are propagated by budding or grafting, to maintain true-to-type scion cultivars and enhance their horticultural performance through use of specific rootstocks. 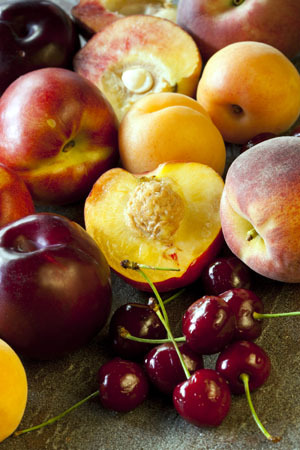 Some Prunus are important specialty crops, including almond (P. dulcis), apricot (P. armeniaca), peach / nectarine (P. persica), European plum (P. domestica), Japanese plum (P. salicina) and hybrids, sweet cherry (P. avium), and sour cherry (P. cerasus). Some are attractive ornamentals, such as flowering cherry (P. serrulata) and Japanese apricot (P. mume). Many wild species need further exploration for potential scion and rootstock improvement or other utilization. Available Prunus transcript data in GDR . Click on the Transcript Assembly name for more detailed information. The Prunus Reference Transcriptome (Prunus RefTrans v1.0) from published RNA-Seq and EST data is coming soon.